Mimi awakens on Fat Tuesday morning and hurries to a breakfast of hot beignets (French doughnuts). At the table, Mimi’s parents explain Mardi Gras traditions such as king cake, and the observances of Ash Wednesday and Lent. Afterwards, dressed in colorful costumes, they depart for a day of Carnival excitement and parade watching. 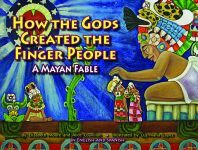 Alice Wilbert Couvillon and Elizabeth Butler Moore, authors of Louisiana Indian Tales and Mimi and Jean-Paul’s Cajun Mardi Gras, are both native Louisianians who experienced the thrill of their own first Mardi Gras years ago and later relived that excitement through the eyes of their children—a sort of on-the-job training for writing Mimi’s First Mardi Gras. 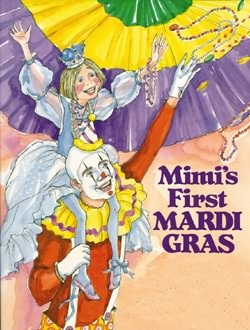 Illustrator Marilyn Carter Rougelot utilizes an active imagination and lively colors that capture the sights of Mardi Gras for Mimi, and all of us. 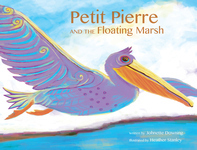 Rougelot is the illustrator of Louisiana Indian Tales and Mimi and Jean-Paul’s Cajun Mardi Gras, as well as Portraits of Extraordinary Women, all published by Pelican.